Bloom Racing Stable and Allen Racing's Midnight Bisou continued her dominance of the West Coast 3-year-old filly division on Saturday, rallying from far back to win the Grade 1 Santa Anita Oaks by 3 1/2 lengths under Mike Smith, who also won the G1 Santa Anita Derby aboard Justify. Trained by Bill Spawr, Midnight Bisou, a 3-year-old by Midnight Lute, covered 1 1/16 miles on a fast track in 1:44.79 and paid $3.20 as the heavy favorite. Spectator finished second, 3 1/2 lengths ahead of Thirteen Squared in third, with Exuberance fourth in the field of nine. Midnight Bisou, who already had 60 Kentucky Oaks points, picked up another 100 points and will be pointed toward the Kentucky Oaks at Churchill Downs on May 4. The Santa Anita Oaks gave 100-40-20-10 Kentucky Oaks points to the top four finishers. Midnight Bisou has the most points in the Kentucky Oaks leaderboard, 160, compared to 154 for G1 Ashland Stakes winner Monomoy Girl. Midnight Bisou has raced much closer to the pace in her four previous races: nose losses to G1 winner Dream Tree in a maiden race and the Desi Arnaz Stakes at Del Mar, and daylight victories in the G2 Santa Ynez and G3 Santa Ysabel at Santa Anita. In the Oaks, she had just one filly (Exuberance) beat in the early going as Thirteen Squared set the pace through fractions of :23.47, :47.63 and 1:12.04 for the first six furlongs. Smith kicked Midnight Bisou into gear approaching the far turn and she picked off horses quickly and was bearing down on the leader at the top of the stretch.Midnight Bisou took command in the stretch after a mile in 1:38.01 and drew off to win easily. 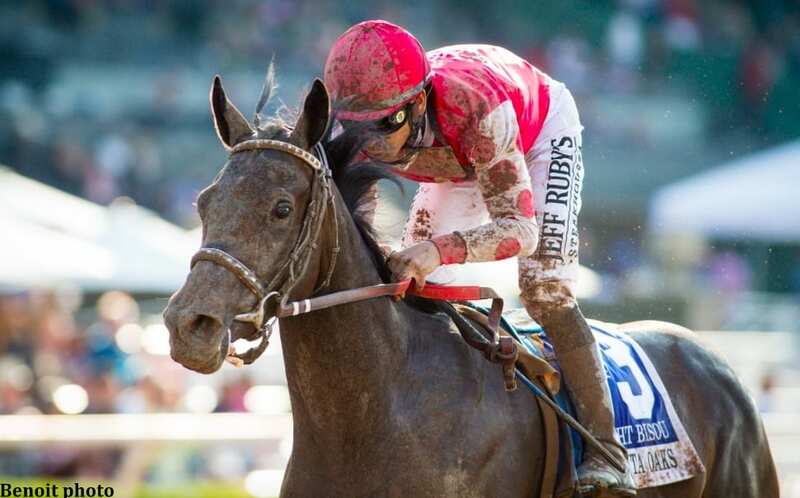 This entry was posted in Racing and tagged allen racing, Bill Spawr, bloom racing stable, kentucky oaks points, midnight bisou, midnight lute, santa anita, Santa Anita Oaks by Paulick Report Staff. Bookmark the permalink.